Pro-M Racing and Mass-Flo EFI create the next generation of aftermarket mass air based, sequential port electronic fuel injection system. West Brookfield, MA - May 10, 2013: Two of the most trusted names in aftermarket automotive technology have merged to bring you the all new Pro-M Racing Engine Management System. For almost a decade Mass-Flo EFI has been the leader in sequential port mass air based aftermarket EFI systems. Automotive enthusiasts know Pro-M Racing as the leader in mass air technology. In 2006 Chris Richards the founder and owner of Mass-Flo EFI, Inc., bought Pro-M Racing and set new standards for quality in the aftermarket mass air business. In 2013 Richards released a new Engine Management System that is absolutely the finest on the market. The all new Pro-M EFI Engine Management System. Once again proving there is no competition. "The Pro-M EFI Engine Management System is simple enough for anyone to install" says Chris Richards. 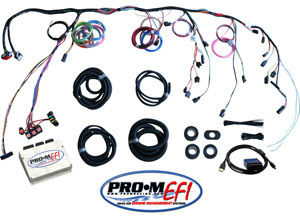 Customers have the option of having Pro-M EFI create a PLUG N PLAY tune that allows you to install the system and turn the key, or if you prefer to do it yourself, you can start with the base tune, and make a few simple adjustments. The Pro-M EFI system is 100% ODB II compatible, and can be used with any generic scanner or code reader on the market. Even better, the Pro-M EFI calibration tool allows you to use your laptop as a very powerful scan tool, putting far more information at your fingertips than any scan tool could ever provide. The Pro-M EFI system allows the end user to control every aspect of the computer, without being a tuner. If you want to control NOS, shift lights, super chargers, turbos, 2 stage rev limiter and more, you can do so with no add-ons. It's all done in this one processor. Richards also went on to explain that this processor is water and shock proof, built by the same manufacturer that builds many of the OEM processors. The Pro-M EFI processors must pass the same rigorous stress testing that the OEM processors are subjected to. Something you will not find elsewhere. Pro-M offers this system as a “management only” package and also as a complete package for most any engine. Complete packages include everything from the intake to the ignition system to the fuel supply system. Everything you'll need to convert a carbureted vehicle to EFI. They also offer a harness and computer package that is a drop in replacement for the Fox Body Mustangs, with other vehicle offerings to come in the future. This is the next evolutionary step in the aftermarket EFI industry and can only be brought to you by Pro-M Racing. For more information on the Pro-M EFI Engine Management System or Pro-M Racing line of mass air meters go to http://www.promracing.com.